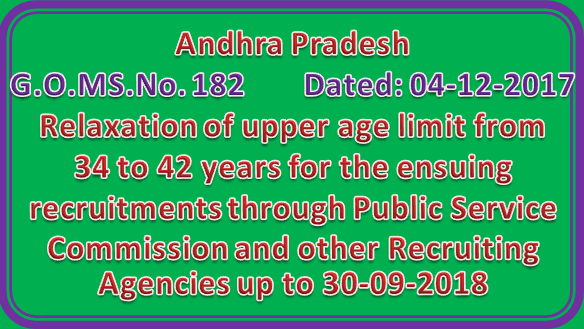 PUBLIC SERVICES –Direct Recruitment – Relaxation of upper age limit from 34 to 42 years for the ensuing recruitments through Public Service Commission and other Recruiting Agencies up to 30-09-2018 – Orders – Issued. In exercise of the powers conferred by the proviso to Article 309 of the Constitution of India and of all other powers hereunto enabling, the Governor of Andhra Pradesh hereby makes the following amendment to the Adhoc Rule issued in G.O.Ms.396, G.A. (Ser.A) Dept., Dt.05.11.2016. In the said Adhoc Rule, for the expression “up to 30.09.2017.” the expression “up to 30.09.2018” shall be substituted.